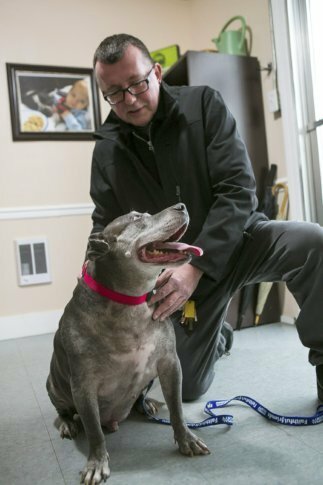 Today, Buchmann is no longer homeless — and despite Buster’s death, no longer alone. Executive Director Jane Pierantozzi was surprised, but not unhappy, to come into work and find Buster ensconced in one of the shelter’s meet-and-greet rooms. The truck didn’t work out — where could he fit the 120-pound Buster? — so Buchmann sold it to a co-worker and bought a 2006 Subaru Forester. The $34,000-plus went to getting his finances in order. Wayman’s heard nothing but good things about Buchmann, who shows up on time for work, has gotten himself certified and is moving up the ladder at Wayman Fire Protection. “It’s not often that these things work out, quite frankly,” said Wayman, who is also a supporter of Faithful Friends, which is less than a mile from his firm. Shortly before hiring Buchmann in 2014, Wayman adopted a dog named Abbie from Faithful Friends as a companion for Charlie, the adorable Boston terrier featured on the company’s billboards. Buchmann always said he would resume volunteering at Faithful Friends after getting settled, and he’s remained true to his word, making frequent visits and donations. Geannine Checchio, who manages Faithful Friend’s dog department, described the 7- to 9-year-old canine as “reactive” to his surroundings and prone to barking. “He was definitely one of those dogs who was overlooked because of his behavior in the kennel,” she said. The dogs were removed from the house two at a time, with Matteo in the last pair. Once at Faithful Friends, it became clear the dog wasn’t fond of women. Even when someone knocks on Buchmann’s apartment door, Matteo is quiet. The only thing that really sets him off is the vacuum, Buchmann said. “Except now I have to pay,” Buchmann said, laughing. Buchmann said financially, he’s doing OK. Like many Americans, he lives paycheck-to-paycheck, budgeting carefully to make the rent. Buchmann keeps busy, relaxes when he can and said his outlook on things hasn’t changed much. “Even when I was homeless, I was at peace,” Buchmann said. He said he owes all the remarkable changes in his life to Buster. If not for the dog, Buchmann thinks he wouldn’t have received those donations in 2014.